The National Association of the Deaf mourns the passing of Chuck Baird, an extraordinary artist who showed the beauty of Deaf culture and American Sign Language (ASL) through his amazing artwork. Chuck Baird passed away on February 10, 2012 after a long battle with cancer. His life and work is a testimony to his talents, imagination, and creativity. Born February 22, 1947 in Kansas City, he attended the Kansas School for the Deaf and went on to attend Gallaudet College and then the National Technical Institute for the Deaf (NTID), where he graduated with a Bachelor of Fine Art degree (BFA) in Studio Painting in 1974. 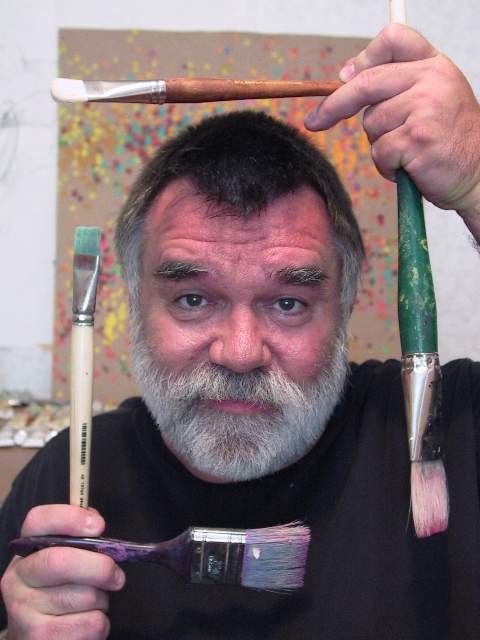 Chuck began his art career by painting sets for the National Theater of the Deaf (NTD) for five years, as well as his own artwork while living in New York and Delaware. He furthered his art by joining Spectrum, which is considered a deaf art colony, in Texas. He then returned to the NTD for ten years both as a set designer and as an actor, including being the lead in three plays. Recognition of his artwork took off after that when he produced many eye-catching and fascinating paintings that made us look at life through the lens of ASL. Chuck dedicated a great deal of his time to Deaf community events and was involved in the Deaf View Image Art (De’VIA) exhibits throughout the country. He worked tirelessly to bring his love of art to deaf children at schools and camps, as well as to the world at numerous art festivals. His style was so distinctive that everyone recognizes a Chuck Baird painting. There will never be another person like him; he was truly one of a kind and is dearly missed by all.